Age discrimination is what happens when an employer treats an applicant or employee less favorably because of his or her age. The Age Discrimination in Employment Act (ADEA) protects against age discrimination for people who are 40 years or older. And it’s this population that is of growing concern to the EEOC and others who advocate for fair hiring practices. A recent EEOC hearing was assembled to discuss the plight of the older worker in today’s economy. U.S. Labor Department representative, William Spriggs, reported that unemployment for people 55 and older climbed from 3 percent in November 2007 to 7.3 percent in August. He said that workers older than 55 spend far more time searching for work and are jobless far longer than younger workers. The past 22 months have been the longest bout of high unemployment older workers as a group have experienced in 60 years, according to Spriggs. While most employers understand that it’s illegal to make hiring and firing decisions based on race or gender, age discrimination is viewed as a lesser known yet equally illegal factor to consider in the employment decision making process. How Can You Avoid Age Discrimination? As an employer, how can you avoid becoming subject to “age discrimination” headlines like these? First, it’s important to know that an employment policy or practice that applies to everyone, regardless of age, can be illegal if it has a negative impact on applicants or employees age 40 or older and if the policy or practice is not based on a reasonable factor other than age. Second, employers must know that ADEA forbids discrimination when it comes to any aspect of employment, including hiring, firing, pay, job assignments, promotions, layoff, training, fringe benefits, and any other term or condition of employment. From a background screening perspective, the ADEA does not specifically prohibit an employer from asking an applicant’s age or date of birth. However, since the “age question” may deter older workers from applying for employment or may lead to the perception that an employer intends to discriminate based on age, employers are wise to use caution when requesting age information before the applicant is officially hired. 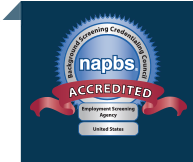 Let us help you create a solid employment screening program that enables you to gain insightful and compliant information about the people who may join your workforce.